I’m referring to Ephesians 5 and 1 Peter 3, of course—well, half of them, anyway. Is the apostolic instruction that wives submit to their husbands inherently abusive? Does a refusal to redact that part of the whole counsel of God enable domestic violence? That’s what John Shore alleges by anecdote in a recent blog post. My alarm bells went off the moment he identified himself as a “Bible-believing Christian.” That’s code for the kind of anti-gay, anti-science, anti-women, anti-thinking Christian who ruins Christianity. Suffice to say, Shore’s analysis is not a work of Christian theology, but of the heresy of theological liberalism in which, in true Hegelian fashion, the Spirit of the Age is confused with the Holy Spirit. Despite Scripture’s myriad warnings against it, worldliness is embraced as the highest theological virtue and so Christianity must be conformed to our culture’s leftist mores. Actually believing what Christ says in contradistinction to popular culture ironically ruins Christianity. In other words, it’s just the same old song and dance the Church has had to deal with since Schleiermacher. How does a church body (or an individual, for that matter) who believes in traditional gender roles avoid priming women—psychologically conditioning them—to become emotionally and spiritually trapped in an abusive marriage? People will tell you that there are no bad questions, but that is not true. This… is not a good question. You might as well ask how someone can teach the Fourth Commandment without priming boys and girls to become victims of child abuse. It’s simply a rhetorical device that poisons the well by presenting God’s design of humanity as a dangerous curse rather than a blessing—as though pastors and teachers need to make God’s Word safe before we stoop to teaching it. The truth, however, is that abuse is not any more inherent in a husband’s authority over his wife than it is in parents’ authority over their children. Modern Americans tend to view all authority with suspicion, but that reflects a problem with us rather than a problem with authority. To be sure, those who were actually abused as children do have a hard time trusting either parents or a God who exhorts them to honor such parents. This is a true spiritual injury and therefore needs to be treated with sensitivity by teachers. However, the practical fact remains that abuse is not the only reason someone might have trouble with the command to honor one’s parents. Spoiled kids rebelling against their parents find it just as difficult—maybe more so. What’s more, spoiled kids are a more common occurrence than abused kids. Accordingly, a teacher cannot simply act as though all his pupils were abused and teach with what would be to most people an exaggerated and obsequious kind of sensitivity. Neither can a teacher blindly accept his pupils’ opinion of their own parents and curtail his instruction on demand. After all, the spoiled teenager genuinely thinks he’s being abused when his parents impose a curfew, refuse to countenance his fornication, and tell him to stay sober. The spoiled are simply not capable of distinguishing between abuse and parental authority. No, the teacher’s only real choice to to boldly teach the Fourth Commandment to everyone and keep an eye out for victims who need special instruction on top of that. And indeed, that is what the Church typically does; it doesn’t often occur to pastors and teachers to do otherwise. When it comes to Christians who believe their religion is actually true, the well is not yet poisoned on the issue of parental authority. 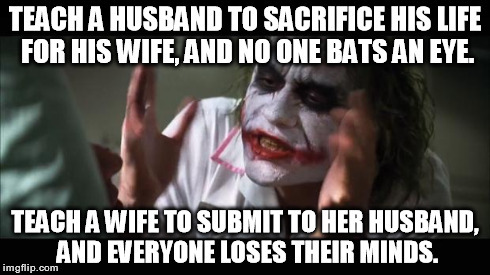 Unfortunately, the same can not be said on the issue of husbands’ authority. The sad truth is that feminist America has infected the church with the false but ubiquitous belief that a husband’s authority is more danger than blessing. Once again, this is entirely understandable for victims of abuse; they need special help and attention because of their special circumstances. At the same time, however, the far more common cause of distrust for God’s instruction is a rebelliousness among spoiled adult women. You can can see it in the way complaints of abuse increasingly mirror those of the rebellious teenager. Real abuse is obvious, but as I’ve written before, the victims of real abuse are very often being cast aside through absurd expansions of the concept of abuse. Blaming (e.g. “I can’t believe you forgot to pay the credit card bill.”) is considered abuse by many rubrics. Yelling (e.g. “I can’t believe you forgot to pay the credit card bill!”) is considered emotional abuse. Controlling behavior (e.g. “you can’t keep running up the credit card bill.”) is considered economic abuse as are both sharing and not sharing money (good luck avoiding both of those at once). While real abuse is a tragedy, criteria like these comprise a farce that does nothing but stoke resentment among the spoiled. Defining abuse in a way that effectively makes all long-lasting relationships abusive creates the illusion that abuse is the norm in marriage and that the institution therefore needs to be modified away from God’s design in order to make it safe. When this illusion makes it into the Church, it brings the temptation to be ashamed of the responsibilities that God gives husbands and wives—particularly the latter. This shame leads teachers to modify God’s word until it is more to our culture’s liking. Without exception, whether in Sunday Bible study or at seminary, every time I have heard Ephesians 5 taught, verse 25 is laid out straightforwardly with a healthy dose of shaming for those men who do not aspire to love their wives as Christ loves the church—even sacrificing himself for her. This is as it should be. And yet, every time those same teachers teach verse 22, which instructs wives to submit to their husbands as unto Christ, they spend the entire time hedging—explaining nothing but instead piling up (often dubious) exceptions until submission has no tangible meaning at all. And that’s if they don’t just gloss over it entirely to spend their entire time instructing husbands on how leading their wives really means doing whatever they want (reality check: that is not at all how Christ serves the Church.) This is poor instruction—particularly when it is verse 22 that our culture is most apt to rebel against. As with the Fourth Commandment, the only real solution is to boldly teach it all. I don’t mean what most Americans mean by this—to nuance submission until it becomes comfortable for feminists. Once it becomes that comfortable, it ceases to be submission at all. Headship and submission are not mere mutual respect, for mutual respect does not adequately describe the Church’s submission to Christ. Nor is a husband’s headship mere spiritual headship, for Christ is not merely the spiritual head of the Church. Neither is the submission best described as mutual, for though Christ sacrifices himself for the Church, he does not submit to us as we submit to him. Likewise, boldly teaching does not entail adding all sorts of worldly exceptions to God’s word. A wife does not submit merely inasmuch as her husband is being Christlike—Peter explicitly instructs the opposite in his first epistle. Neither does a wife submit merely inasmuch as she agrees with her husband, for that is not submission at all. The only mitigation of a wife’s responsibility to submit is to serve God rather than man—she must not obey her husband when he forbids what God commands or commands what God forbids. Nevertheless, the normal circumstance is that submitting to her husband is serving God because that’s what God has specifically asked of her. Even in abnormal circumstances, one should always remember Luther’s admonition: if you say that God is telling you to do something against the secular authorities he instituted, then you’d better be able to show it in writing. What boldly teaching headship and submission does entail is that we give the whole picture. The husband’s authority is to be used for his wife’s benefit—even to the point of his own death. He is not to abuse it for his own benefit. Doing so is blasphemous, for this whole thing was meant to be an image of Christ and the Church. Likewise, the wife is to submit to her husband as unto Christ in everything. This means exactly what it sounds like, no matter how much it grates the ears of those who have absorbed feminist principles—that’s why Paul repeats the comparison three times back-to-back in two verses. This is the highest privilege of spouses, for this is precisely the manner in which humanity as a whole is made in the image of the Triune God. The Father, Son, and Holy Spirit love each other—give themselves to one another—so completely that these three persons are only one substance. This self-giving love is carried out according to their unique relationships—the Father unbegotten, the Son begotten, and the Spirit proceeding. There is no concern whatsoever over whether the difference between begotten and proceeding disadvantages one person or the other for they are united in love. Likewise, for humans, husband and wife (and children, for that matter, but that’s another topic) give themselves to each other completely according to their own unique relationships—the husband by love and self-sacrifice and the wife by submission and obedience in all things. By giving themselves to each other in this way, they each receive back everything they give and more besides. They lose nothing and gain everything. At the same time, we are also living, breathing artwork depicting the relationship between Christ and his own bride, the Church. Shame on us for despising such a gift! However, the whole picture also includes the fact that God puts no conditions on these roles. 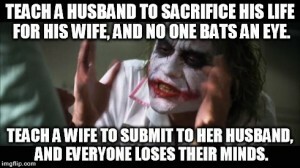 The husband is to sacrifice himself for his wife even if she abuses that sacrifice, for Christ also died for the Pharisees and Scribes who murdered him and for the hordes of unbelievers who reject him. Likewise, the wife is to submit even to a husband who does not obey the word, for to suffer as a Christian is to share in Christ’s sufferings. Without a doubt, when sin enters the picture, these offices become genuinely daunting, but how is that different from any other aspect of living in a fallen world? God has not given us a spirit of fear, for Christ has overcome the world. Our victory is not based in worldly success, but in Christ’s new creation. Giving of ourselves to others is part-and-parcel of Christianity. Christianity describes itself as both an offense and a stumbling block. Such a religion will always be in friction with the surrounding culture in some way or another. The contemporary friction over issues of sexuality are simply the offenses peculiar to the time and place we’ve been given. We must rise to our own challenge just as our ancestors in the faith did to theirs. We will never do so through a worldliness that trades doctrine for trends or through a fear that keeps us silent until we figure out a way to hide or nerf the offensive parts. We will only do so through boldness and conviction in teaching what Christ has given us to teach. This entry was posted in Feminism, The Modern Church, Theological Liberalism. Bookmark the permalink.